Silver Strand Falls is another victim of people looking the wrong direction from a spectacular view point in Yosemite Valley. It is tucked high in the cliffs above the Wawona Tunnel View (Standing Underneath Volcanoes) on the south side of the valley. The falls are around 600 feet tall, and spill over a cliff of Taft granite, a fine- to coarse-grained white to gray biotite granite that is locally porphyritic with phenocrysts of potassium feldspar. The rock was intruded about 96 million years ago. Looking through my files, I found only three pictures of the falls, and all were wintertime shots when the falls were frozen. I am also guilty of ignoring them! Yosemite Valley is especially stunning because of the striking number of waterfalls, some justly famous, and a number of others less so due to their ephemeral nature and sometimes just from being a semi-precious stone amongst precious jewels (a beautiful amethyst amongst sapphires, if I can make a bad analogy). Todays relatively unknown waterfall is another that shows up for just a few months in the spring: Royal Arch Cascades. They are most noticiable through the trees behind the Ahwahnee Lodge on the north side of the valley floor. They form a long, sloping millrace down the cliff, dropping about 1,200 feet, before disappearing into the forest on the valley floor. I actually find them to be sort of unremarkable from most angles, but it turns out that the base of the falls is very easy to access, and they reveal a beautiful mosiac pattern on the cliffs when viewed from that location. You merely need to follow the trail at the east end of the Ahwahnee Lodge parking lot for a few hundred yards, and then scramble up the talus slope for just a few yards. 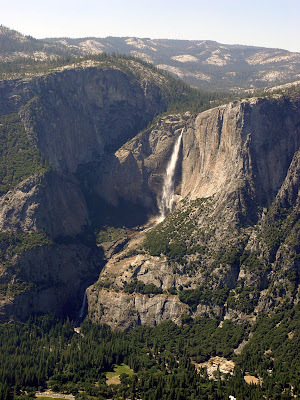 The falls spill over a cliff of the Half Dome granodiorite which was intruded around 86 to 88 million years ago. In addition to the requisite feldspar, quartz and biotite, a careful search of the rock will reveal little yellowish crystals of sphene. The rock is relatively free of joints, and this leads to the formation of some interesting reverse exfoliation features at the Royal Arches themselves just to the east of the falls (probably a future post). Nearly four million people visit Yosemite Valley every year. I doubt that more than a few dozen ever see Royal Arch Cascades from the base. Give it a look! I hope I am not driving the subject into the ground, but I love describing a trip through Yosemite as an exploration of a series of volcanoes from the underside looking up. The rocks, most granitic, formed as magma cooled very slowly over tens of thousands of years, leaving visible crystals that give the familiar speckled look of the rock. 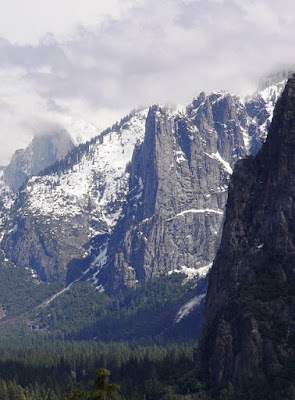 Today's post, continuing the theme of the less recognized sights in Yosemite Valley and other parts of the Yosemite National Park, is a sight that is sometimes noticed by visitors in April and May, but never seen by the vast majority of summer tourists. It is dry most years by June. 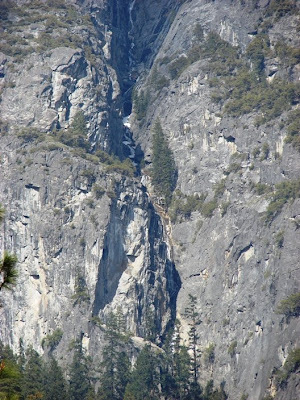 And yet it is the tallest unbroken waterfall in Yosemite Valley: Ribbon Fall. The more familiar Yosemite Falls include three segments, the tallest of which is the Upper Falls at 1,430 feet. Ribbon Fall leaps nearly 200 feet more: 1,612 feet. The fall lies just west of El Capitan, and the cliff it leaps from is composed of the same mostly unjointed El Capitan granite. 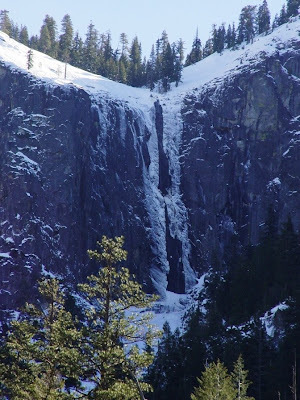 It is most easily seen from the parking area on the main park road just east of Bridalveil Fall Parking Lot. No trails approach the fall, not from the bottom, and not from the top. I photographed Ribbon Fall many times, and thought that it leaped from a sheer planar wall of rock, but in 2005, a low cloud layer brought a different perspective: it lies within a narrow alcove that is outlined by a series of vertical joints. The waterfall is barely visible in the left alcove in the picture below. The cliff on the far right is the west wall of El Capitan. The fall was beautiful last week. Be sure to check it out if you are in Yosemite in the next few weeks! This month's Accretionary Wedge (Accretionary Wedge #8 ) is hosted by Andrew Alden at About Geology, and the entries involve our responses to Earth Day. Mine is a bit late in coming; I reward myself with a blog entry if I get my other work done, and this has been finals week. It's been a bit hectic! I offer today a picture of my most sacred spot on the planet (so far): the edge of Cedar Mesa at Muley Point. 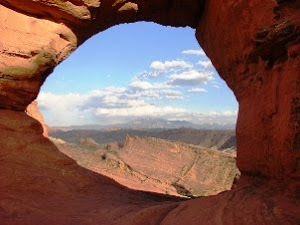 The cliff below the rocks drops 800 feet straight down to a flat plain which is then carved by the San Juan River into intricate canyons some 1,200 feet deeper still. Monument Valley and the Raplee Anticline lie in the distance, as well as the towns of Cortez CO and Farmington NM. It is a precious place to me, full of mystery, beauty and solitude. Ghosts of the Ancestral Pueblo people lurk here, and the fossils of Permian reptiles as well. But...hidden in the bottom of the deep canyon is the greatest upstream extent of the artifical evaporation pond of Lake Powell. On a 1964 topographic map of the National Recreational Area, there is a notation at Muley Point: "slated for development". In the distance, at Mexican Hat, oil wells pump the black liquid from the ground, and around Farmington, a GoogleEarth view reveals hundreds or thousands of gas wells. Coal is mined from Black Mesa, off to the south, and evaporite minerals are torn from the ground to the north of Canyonlands National Park. 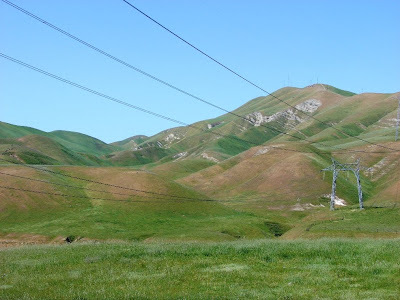 Power lines criss-cross the region. My favorite place is under siege. Of course, we need all these things to live, but the point of my entry today is this: there is a price to be paid. The price takes many forms, from high prices on commodities, in foul air, polluted rivers, extinct plants and animals, and in the almost never recognized loss of the wild places of our planet, the gauntlet in which our ancestors survived and thrived. We have lost touch with the earth that gave us our birth, and which continues to nurture us, despite our abuse. And our abusive ways are about to come to an end, one way or another: we will finally destroy the last of the wild places, drill the last drops of oil and shovel the last lumps of coal, we will melt the last glaciers, and deplete the last soils. Or, we will choose not to do these things, and exist on our planet in a new way: a sustainable existence that finds a way to give something back to our planet. The oil is running out, and thus the price spikes. We will never see cheap oil again. The mass conversion of agricultural fields to the growth of biofuels is causing grain prices to spike, and we are becoming less and less able to feed the hungriest people on the planet (Malthus is in the air; "Running Out of Planet to Exploit," ). The prices of metals are climbing. Change is possible, and I sometimes see hopeful signs, and part of my optimism comes from Earth Day, and the works of good people to bring awareness to those who are waking up to the spectre of high prices and resource limits. We have a choice though...we can let the decisions about the future to be made by energy companies and their political lackeys, or we can demand a future based on sustainability. It will take education, and an end to the corporate media's obsession with Britney and Paris, and kidnapped white women, and American Flag Lapels. People, when given the right information, can make the right choices. Those are my thoughts this week. You are welcome to comment! We continue our week's tour of the less famous parts of Yosemite Valley. 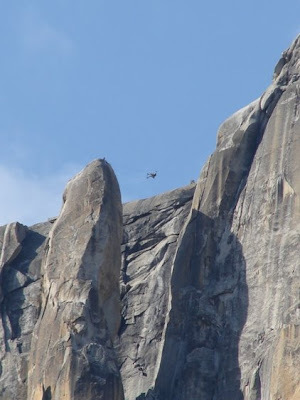 The Lost Arrow is a fairly familiar sight if you know where to find it, tucked into the cliff just east of Yosemite Falls (see Under the Volcano: Changing the Emphasis -Part 4 ). It is tricky to get some sky behind the rock for pictures, but the clouds cooperated for me in April of 2006. The rock once again is Sentinel granodiorite, and the Lost Arrow is outlined by some prominent vertical joints. As can be seen, the spire is a popular technical climb. I've not had the pleasure (I'm getting a bit too old and fat to even contemplate this kind of exercise), but if you are wondering what the view is like looking down, check out http://www.100megsfree.com/dew4theq/rock/yosemite/yosemite02.htm. Look at Yosemite Falls from another angle: in this case I was perched atop Taft Point, which is reached by trail from the Glacier Point Road. Like a number of other geological mysteries over the years something bothered me, but never to the point that I solved it with insight and creativity. Other people had to do it for me, in this case N. King Huber. It had to do with the strange cleft of rock to the left of the falls. The trail to the top of the falls follows this declivity, but why is it there? And ask yourself: shouldn't Yosemite Creek be following that canyon? If it did, it would be no more remarkable than the practically unknown Lehamite Falls described in the previous post. Huber passed away recently, after a long career with the USGS, and later as a populizer of geology for the Yosemite Association. His final book, Geological Ramblings in Yosemite (http://www.yosemitestore.com/Templates/frmTemplateP1.asp?SubFolderID=114&SearchYN=N&t=9&p=3) is a delightful collection of essays culled and adapted from articles he did for the Yosemite Association Magazine. In one of them, he explains the mystery. Yosemite Creek did follow the cleft! And probably for a very long time. But, during one of the last glaciations, a lateral moraine blocked the old waterway, and forced Yosemite Creek over the brink of the sheer cliff where it now flows. The old waterway seems more obvious in a picture where the falls are dry, such as the photo below, taken in October. I appreciate the insight of geologists like Huber, and of the way they make the information accessible to the lay population. 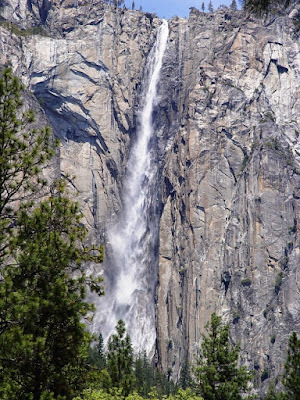 Continuing a series of exercises on observing the generally unobserved wonders of Yosemite Valley, I offer today TWO waterfalls whose combined heights exceed 1,000 feet. One is world-renowned and is an icon of the National Park Service. The other is in the picture above, is ignored by practically every park visitor, has been photographed by yours truly only twice, and is the only waterfall in the park to retain it's original Miwok name: Lehamite Falls. 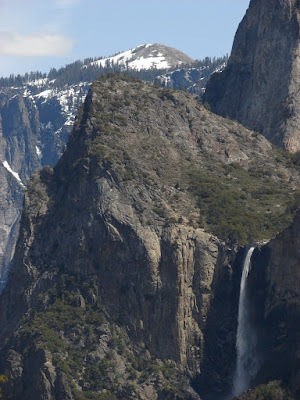 Admittedly, it lacks the drama of Yosemite Falls, but it is interesting to me because it recalls a quirk about the history of Yosemite Falls: were it not for a chance movement of the Pleistocene glacier of Yosemite Creek, the Yosemite Falls would be as obscure as Lehamite Falls. And they were for a very long time. First, the falls themselves. They lie in the far right side of the first picture in the shadowed cleft. The second picture is a zoom. They fall over a series of steps of only a few hundred feet at a time. Like many other of the waterfalls of Yosemite Valley, they only flow for a few months out of the year. Still, they drop 1,180 feet, which anywhere else in the world would be considered significant. I was going to show some really cool metamorphic rocks along the Merced River on the way to Yosemite National Park, but the view of the rocks was obscured by a bunch of organic things, so you will just have to imagine how beautiful the rocks were....I am headed up there tomorrow for one more field trip. If the falls are bursting, I will have to break down and show some more classic views of the valley in my future updates. OK, OK, I found some rocks down along the riverbank. These are some folded cherts, presumably part of the Calaveras Complex, a Permo-Triassic accretionary wedge complex that is exposed on the river between Savage's Trading Post and the Ferguson Slide. There is a turnout and an actual geological marker next to the highway that explains the origin of these rocks. It refers to the rocks as the oldest in the Yosemite region, although it is probably just snarky to point out that older rocks (the Paleozoic Shoofly Complex) are exposed two or three miles upstream, and that some Proterozoic rocks have been described in metamorphic roof pendants north of Yosemite National Park. I'm just glad they took the time to make the sign. 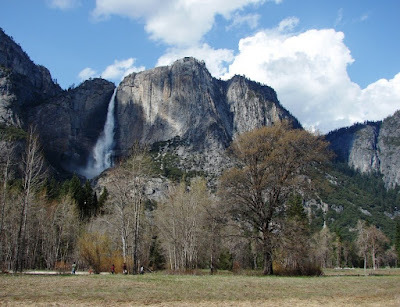 Yosemite Valley is one of the most familiar of our national parks, but this week I have been trying to tease out some of the valley sights that are overshadowed by the famous iconic domes and waterfalls like Half Dome, El Capitan and Bridalveil Falls. In any other setting around the planet, these little-known cliffs and falls would be renowned. 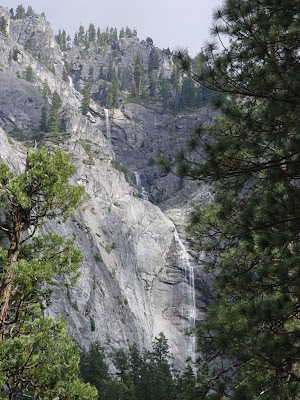 This beautiful wispy waterfall is not visible from the Wawona Tunnel View (unlike the features of the last few postings), but instead lies hidden between Sentinel Rock and Cathedral Rocks. It is called the Sentinel Falls, and like before, is one of those relatively unknown treasures that is usually trumped by a stunning view of Yosemite Falls, which lie on the opposite side of the valley. In other words, everyone looks the wrong way. The falls drop about 2,000 feet, although no single drop is more than a few hundred feet. It also evident from the limited discharge that the falls dry up relatively early in the summer. 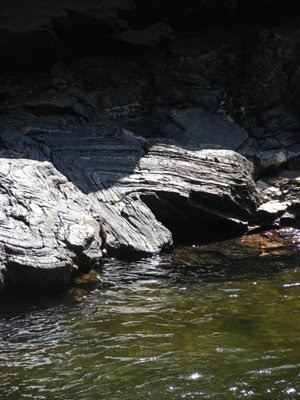 The rock over which the falls plunge is the Sentinel granodiorite, which was described in yesterday's post. Once again, I continue a tour of the rocks and other features that sometimes get lost in the shuffle of an iconic view from a famous spot: the Wawona Tunnel View of Yosemite Valley (Standing Underneath Volcanoes). Today, we use a bit of well-placed cloud to blot out Half Dome, and snowy slopes for a backdrop, and suddenly a stunning spire comes into focus: Sentinel Rock. 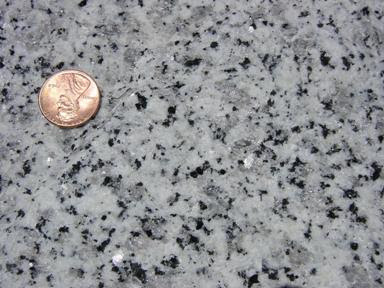 This rock is composed of the Sentinel granodiorite, a coarse-grained, dark-gray, biotite-hornblende granodiorite with abundant sphene that was intruded during the Cretaceous period, about 93 Ma. Another reason that Sentinel Rock receives less attention is that stands across the valley from Yosemite Falls, and many people, entranced by the play of water over the cliffs, never look behind to see this beautiful spire (Yosemite Falls tumbles over a cliff of Sentinel granodiorite as well). The classical and long-familiar view of Yosemite Valley from the end of the Wawona Tunnel has become so iconic that it is easy to forget how spectacular the individual elements of the view would be in any other setting (see Standing Underneath Volcanoes from a few days ago) . Since getting my first digital camera in 2001, I have been to Yosemite Valley 22 times, and I always take the same picture! It's true that every visit is different, with different clouds and light conditions, but it is hard to stand in front of one of the great panoramas of the world without trying to fit it all into a single picture. So, during the last few visits I tried to zoom in on a few of the pieces that make for such a rich tapestry. 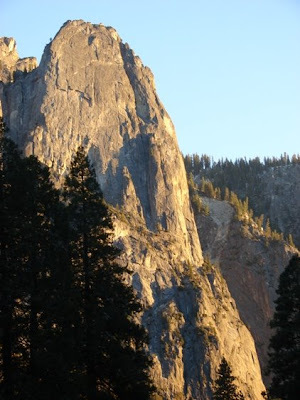 Today, our view is of the lowermost Cathedral Rocks next to Bridalveil Fall (which at 620 feet provides the scale for the picture). The triangular shape of the cliff results from intersecting vertical joint sets. The cliffs are composed primarily of El Capitan granite (about 102 Ma), which is a coarse-grained, white to light-gray biotite granite and biotite granodiorite containing quartz (gray glassy looking grains), orthoclase feldspar (white grains), and biotite mica (black grains)..
Exfoliated Sentinel Dome can be seen at the top of the photograph. The Glacier Point Road pulls to within a quarter mile or so of the summit, and it is an easy climb for an incredible payoff of a view (see some future post!). New Study Shows Odds High for Big California Quakes (with commentaries at California Quakes: 99.7% Sure, and New Forecast for California Earthquakes) is a new calculation of earthquake probabilities in California, and there are some sobering numbers in the report: 99.7% chance of a 6.7 quake somewhere in the state in 30 years, with the highest likelihood in southern California. The chances of a 7.5 magnitude is 46%, and that of an 8.0 is 4%. And, the study didn't even count the probability of a tremor on the Cascadia subduction zone. The workgroup that produced the study was organized by U.S. Geological Survey, the California Geological Survey and the Southern California Earthquake Center. Memories fade so easily. I was a new teacher at Modesto Junior College in 1989 at the time of the Loma Prieta quake, the 7.1 magnitude event that occurred at the worst possible moment of a most miraculous day (5:06 PM on a commuting day; but on the day of the one and only Bay Area World Series between the A's and the Giants...everyone was already home, and deaths were very much reduced by the coincidence). That quake, and effects that it had on our lives here in northern California, was profound; but now, I am one of the old teachers at MJC, and I am getting students who were babies, or not even born yet in 1989. It is no longer a part of our collective consciousness. The problem of a social recognition of earthquake dangers is somewhat less in southern California, given the tragedy of the 1994 Northridge quake, but I still find that many of my students are unprepared for the eventuality of large quakes. They were apparently convinced that the Y2K computer meltdown would affect their lives more. Few have water, food, and first aid supplies set aside, and few really know what to do if a quake takes place. Many still intend to try and stand in a doorway if one happens. 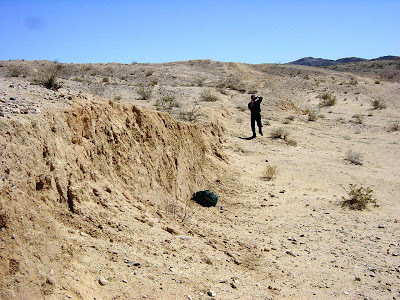 The picture of the day above is part of the scarp formed by the Landers quake of 1991 (actually 1992, I was sloppy and writing too quickly, thanks, andrew ), a 7.5 magnitude event that produced a 50-mile long tear in the Mojave Desert, and killed two people. The new fault line offset pipelines, streets, fences, and houses, and only the remote location kept the death toll down. The picture was snapped in 2003; the dry environment has allowed the scarp to persist. We got lots of little reminders that we live in earthquake country. The Alum Rock quake last November took place minutes after my night class took their earthquake quiz. They were standing outside, and most of them rushed into the building to check out the department seismometer (everyone else was running outside). We are currently experiencing some mysterious activity offshore of Oregon (Earthquake Swarm off Oregon Coast). And always, the little tremors continue all over the state (586 in the last week at magnitude 1 and above at http://quake.usgs.gov/recenteqs/latest.htm; that's about twice as many as normal for the last few years). Oh, and I wasn't sure I should even bring it up, but last night's episode of Eli Stone involved a crank prediction of a 6.8 quake that is going to bring down the Golden Gate Bridge...and then...a quake happens, and the Bridge collapses! Given the "story arc" style of the show, it will be interesting to see if the earthquake continues to be a factor in future plots. And the special effects of the bridge collapse were pretty good for television, at least on my little set. Diagrams and maps of the California faults in this study can be found at http://www.scec.org/ucerf/ including probabilities of particular faults (http://www.scec.org/core/public/sceccontext.php/3935/13664) and the overall probability map (http://www.scec.org/core/public/sceccontext.php/3935/13661). Grand Canyon in the News Again: It's Grand! I follow with great interest the latest research on the origins of the Grand Canyon. In some ways, the Grand Canyon is deceptively simple: on one level, the canyon is simply a pile of stacked layers (which makes for the simplest of creation-science narratives). It was recognized very early on that the Inner Gorge hides great secrets: something like 3,000 meters of tilted Proterozoic layers, some three times thicker than the obvious overlying Paleozoic layers. 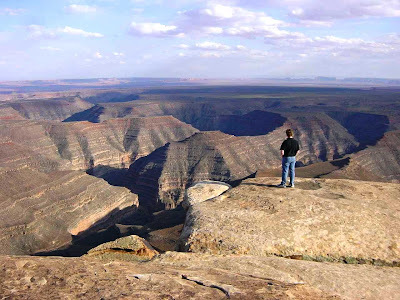 And John Wesley Powell recognized right away the deepest parts of the canyon reveal the very ancient metamorphic rocks that contain evidence of hundreds of millions of years of history that greatly predates any of the overlying sediments. But as I am always telling my students, the rocks tell only part of the story. Here we stand at the edge of a huge abyss, one of the greatest geological showplaces on the planet, and we can't exactly tell how old the gorge itself actually is. 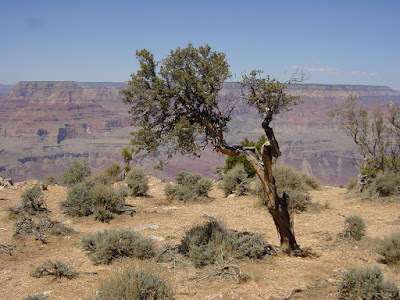 Erosion of canyons removes evidence, and in the case of the Grand Canyon, there are multiple ways of defining the age of the canyon formation anyway. A flurry of stories a few weeks ago discussed how the canyon was older than previous thought [see Grand Canyon Old, Says the News (But Not the Data) for a discussion]. Another article that I noticed today discusses a Grand Canyon that is 55-65 million years old (Grand Canyon May Be As Old As Dinosaurs, 40-50 Million Years Older Than Previously Thought). The article linked here reports on a paper by Flowers, Wernicke, and Farley (May issue of the GSA Bulletin) in which cooling rates of apatite indicate the presence of a deep canyon throughout Cenozoic time. The article makes it clear that the canyon they are discussing was being carved through the thousands of meters thick Mesozoic cover, and they also correctly point out that different parts of the canyon formed at different times and were only recently integrated into the river system we see today. A moment of linking produced a story from several years back concerning portions of the canyon, as much as 700 meters worth, that may have been carved within the last 700,000 years when the Colorado Rivers was swollen to many times its present size due to glacial runoff from the Rocky Mountains (New Evidence Of Lava Dam Failure And Fault Activity Supports Theory That Grand Canyon Is Geologic Infant). The lava dams discussed in the article yet another example of the fascinating stories concerning the origin of the canyon. Great pictures for the imagination. Powell wrote eloquently of the violence of lava meeting water in the canyon bottom. I have talked with my students of previous hypotheses of stream piracy on a monumental scale in the region. What a sight it would have been, to have seen the moment that a river changes its entire course for good! And imagine seeing a 1,000,000 cubic feet per second flood on the Colorado River! The biggest flood on record was only a third of that, in 1884. But such flows may have been common during the Pleistocene. And during all of these events, eyes other than our own species were witnesses: mammoths, mastodons, sabertooth cats, American lions, sloths, giant cave bears, maybe dire wolves, and condors with 11-12 foot wingspans (one of my recent delights was seeing some of Grand Canyon's recently released condors). The Grand Canyon...grand in so many ways! Yosemite Valley and Yosemite National Park contain incredible exposures of the magma chambers that once fed eruptions of volcanoes that topped the Ancestral Sierra Nevada, the mountain edifice that graced the Cretaceous landscape of California and western Nevada (now, when is the last time you heard Yosemite introduced that way?). As a glacially carved valley (ignoring for the moment the work of rivers and mass wasting), Yosemite doesn't really fit the stereotype of a U-shaped valley. It has a very flat valley floor, and instead of a relatively linear valley, it has many reentrants and coves. This in large part is responsible for the unique scenery of this beautiful place. The flat floor exists because lake sediments filled the trough in the area upstream of some of the valley moraines. 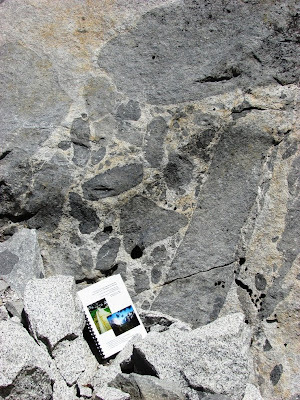 The walls vary, because more than one kind of granitic rock is present, and in fact at least eleven intrusions are defined in the area (see the map at http://virtual.yosemite.cc.ca.us/ghayes/geology.htm). Ironically, the rocks are not all that easily observed up close. The cliff base is often covered with loose and unstable talus, and many of the accessible exposures are covered with lichens. Hetch Hetchy Valley is often a better bet, having been more recently scoured by glacial ice (see my very first picture post: Photo of the Day). A slide in 1982 brought down huge boulders of the El Capitan granite, one of which is pictured above. The photo shows a large number of darker colored enclaves*, blobs of dark rock that probably originated as two different intruding magmas mixed. The enclaves can perhaps be thought of as globules of oil floating in the vinegar of Italian salad dressing. *Enclave: Body of external origin in an igneous rock. 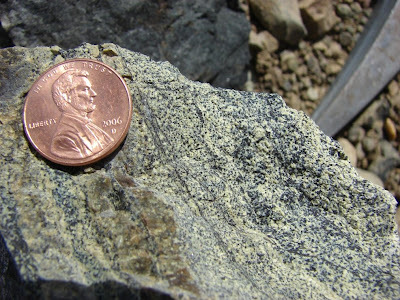 The main varieties are xenoliths (fragments of solid rocks) and microgranitoid enclaves (former magma globules derived by mingling of magmas). Into the last two weeks of the semester, and things are getting hectic, so blogging has been intermittent. But field trips have been part of the fun for the last week, and last week's exploration of the innards of a subduction zone in the Coast Ranges now lead to the rest of the story....where are the volcanoes of the magmatic arc that must of have been part of a convergent boundary? When oceanic crust and sediment is subducted into the mantle, water released into hot mantle lowers the melting point of the rocks in the base of the crust, resulting in the formation of magma, and ultimately of volcanoes. When tourists visit Yosemite National Park, if they think of geology at all, they will probably think about glaciers, and how they sculpted the valley. 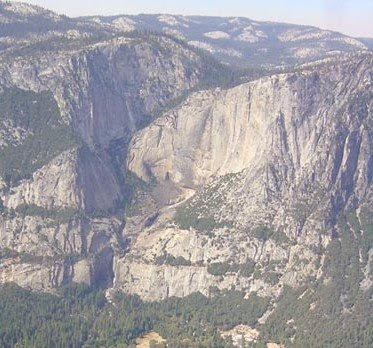 The story is more complex than that, of course, as Yosemite has been carved as much by river erosion and mass-wasting. But when I stand near the famous view of the valley at the Wawona Tunnel exit, I think of how I am standing three or four miles beneath the volcanoes that once existed there. The granitic rocks that make up much of the Sierra Nevada were the product of the subduction zone that lay to the west near the present site of the Coast Ranges, which I explored in last week's posts. Although the volcanoes have long since eroded away at the latitude of Yosemite Valley, the cobbles and boulders of these vents can be found in Upper Cretaceous sediments in places like San Luis Reservoir (but that is a trip for a future post). Today's picture of a view of Yosemite Valley, taken from the same spot that tens of millions of other photos have been snapped, is really a plea to stop and think about how even a familiar scene can be newly appreciated. Can you imagine what it must of been like for those who discovered the valley for the first time (whether speaking of native Americans or of their European conquerors)? I hope in some future posts to get a few people to see Yosemite for the first time, despite having seen pictures a hundred times over. For those who are not as familiar with this view of the valley, here is a short tour: the vast cliff on the left is El Capitan, with a 3,000 foot sheer cliff that is a magnet to rock climbers. The snowy peak in the upper end of the valley is Clouds Rest, which at 9,926 feet is the highest point visible from the valley floor (at 4,000 feet). Half Dome lies just to the right. In the center of the photo lies Sentinel Rock, which I have always thought was one of the less appreciated cliffs of Yosemite Valley; in any other setting, it would be renowned. 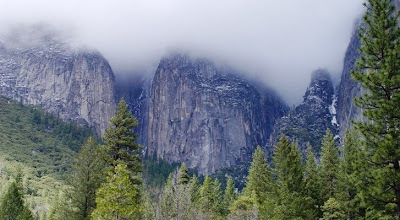 The three triangular peaks on the right are the Cathedral Rocks, with Bridalveil Falls (620 ft) in their foreground. The last prominent spire on the right is the Leaning Tower, but a different angle is required to appreciate the origin of the name. How much can you see in an afternoon in the Coast Ranges of California? In two previous posts, I described how my students had the opportunity to explore the earth's interior, right down to the mantle. 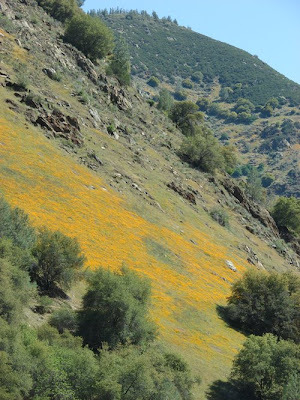 Del Puerto Canyon is a geological treasure, even if it lacks some of the dramatic scenery of other more famous locales. 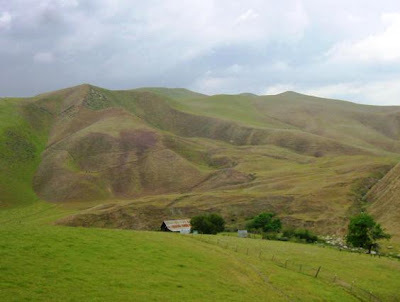 Our trip also encompassed some interesting time travel...the Upper Cretaceous Moreno Formation also includes the K/T boundary in the uppermost section (http://gsa.confex.com/gsa/2004RM/finalprogram/abstract_72988.htm). I have not heard of any studies about the presence of iridium, or clay layers, or shocked quartz in this particular region, or if the section is even conformable, but it is still a neat moment to stand near the mouth of the canyon and point out that the saddle on the skyline separates the "dinosaur layers" from the "non-dinosaur layers". Even better, not more than a kilometer up the canyon is the locality of the first-ever discovery of a dinosaur in California. In 1998, I had the opportunity to tour the canyon in the company of Al Bennison, who discovered the hadrosaur remains in the 1930's when he was a teen. If I understood correctly, the bones came from the scarp at the head of the large slump, near the triangular brush field in the upper left-hand side of the photo below. All in all, a great place to teach and learn geology. Check it out some time if you ever make it out to California. Coming up next...seeing a volcano from underneath! 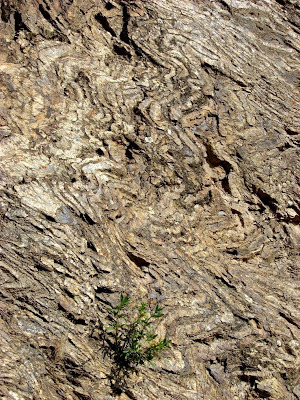 Continuing our trip up Del Puerto Canyon (and into the earth's mantle; see Photo of the Day - Feeling Crushed? ), we reached a huge pod of mantle peridotite and dunite in the upper canyon that had escaped the most extensive alteration during the long journey to the earth's surface (in most places the rock is serpentinized). A few unusual minerals are found in the area, including mercury (cinnabar) and chromite (shown above). The chromite crystals are dark and metallic-looking. The United States imports almost all the chromium that it uses, but in wartime, imports are disrupted, so the mines in the upper canyon were utilized off and on during the two world wars. The mercury was considered far more valuable, given its role in the production of gold during California's Gold Rush of the 1850's. I've heard that the mercury miners could earn a much higher wage mining mercury than they could mining gold, but they also tended to go mad, and die a lot sooner. It's not as if the gold miners had such a great life expectancy, though. We make jokes and complain sometimes about workplace safety regulations, but it is a great deal safer in the mines today than it was 140 years ago. And sometimes, workers even get to enjoy some kind of retirement plan! Photo of the Day - Feeling Crushed? I took my physical geology students geotripping this week instead of their lab sections...Del Puerto Canyon cuts a deep swath through the eastern Diablo Range of Coast Ranges of California. In this single gorge, one can pass through a 6 kilometer thick section of the Great Valley Group (deposited within a forearc basin), a thick and nearly complete ophiolite sequence and underlying mantle peridotite (the Coast Range ophiolite), and a section of the Franciscan Complex (part of an accretionary wedge complex). How many places are there in the world where one can drive right through the crust into a subduction zone, and into the underlying mantle? The picture above is a section of highly deformed cherts of the Franciscan Complex. Was this done in a few weeks? Thanks to everyone for the kind (more or less) responses to my previous post regarding, ahem, research in California. I have been the victim of several such articles in past April issues of Discover Magazine, including one on the discovery of arctic moles who tunnel through ice by having an extra warm nose or something like that. Ron Schott expressed a bit of concern about how much pseudoscience exists on the Internet, and that is the purpose of this latest missive. Writing a devious April Fool's joke involves taking a germ of truth, depending on a certain amount of trust on the part of the reader, and then letting loose with an outrageous distortion that, uh, can't be true, uh, but everything else was so reasonable...and such is the way that so much misinformation becomes part of the pop culture narrative. 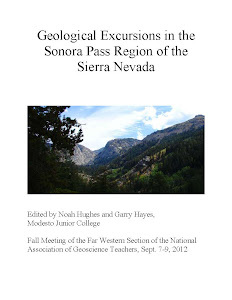 In this instance, I started with an appeal to authority (link to a 'journal' and important sounding names of people who probably have PhD's), and then I took some known facts about the Sierra Nevada (rapid Cenozoic uplift; mantle drip) and mixed it up with some geological terminology that quickly zoomed off into ridiculous territory (magnitude 10.5, a salute to a very bad TV movie). What's the problem with a little fun amongst geological friends? But this is the way it is done on the battleground of public perception in geology and evolution, and the stakes are a great deal higher than an April Fool's prank. Consider...would a person without a geological background be able to recognize the prank? And what if I changed the word "millions" to "thousands" of years? This suddenly becomes a reasonable-sounding creationist explanation of the origin of the Sierra, Central Valley and Coast Ranges from a young-earth perspective. If it were presented as such, could you refute it succinctly, quickly and clearly, without going into a long winded explanation? It isn't necessarily easy, especially if your client doesn't trust you in the first place. This is what we face in Creation-Science world. 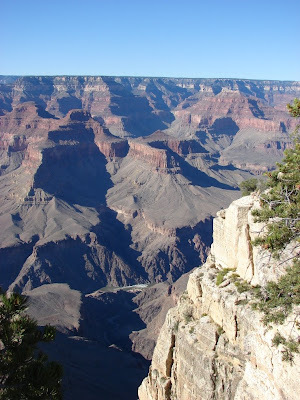 This is a place where all of the sedimentary layers of the Grand Canyon were deposited in weeks or months, and were eroded just as quickly when Noah's flood drained from the continents. It is a world where fossils were formed in a matter of days as the flood swept all life away, and where dinosaurs like T-Rex munched on fruits and vegetables until Eve bit the apple. It is a place where evolution doesn't occur. At all. Except in small bits within "kinds". Oh, and the relatively few "kinds" on the ark (e.g. dog, cat, mouse, deer, cow, and antelope) changed into the thousands of species in the world today during the last 4,000 years since the flood subsided. The dog 'kind' for instance, became all the wolves, coyotes, foxes and domestic dogs (but this wasn't evolution because it happened too 'fast'). And so on, and so on, and so on. These kinds of statements are transparent and ridiculous to those educated in geology, but they are perfectly reasonable to someone whose religion seems to demand belief in a worldwide flood around 4,000 years ago. It supports their faith. And the people providing these stories have their trust because they say they are Christians too. And Christians don't lie or deceive about these things. I realize that many of you are aware of the kinds of thing that organizations like the Institute of Creation Research are up to, and the kinds of deceptive articles they publish. But if you haven't seen what they do, you should check it out, starting right here http://www.icr.org/aaf/. And keep in mind: the people they write for are predisposed to believe every word they read. This is the challenge that geologists and teachers must face in the public arena. It is important to know where people are coming from when they ask strange questions about our science. What's the strangest thing you've come across in Creation-Science World?